Day - Ireland to Scotland. 4.30 am the alarm went off. After a fitful sleep, no thanks to the wedding music until 1 am; we had to get ourselves up and organised for an early ferry from Larne, Ireland to Troon, Scotland. I wanted to get the early ferry so we would arrive early for a full day in Scotland. We were told that the ferry check-in would start at 5.15 am and stop at 6.30 am so we didn’t want to miss it. We made it to Larne easily and there were only 4 cars in front of us at the gate but they certainly didn’t open at 5.15. About 5.30 we started to see the workers arrive and start processing cars. Given we arrived ultra early and sat the longest, it was quite annoying to see that when they loaded cars onto the ferry we were right towards the end; this meant that all those people that slept in longer than us ended up with the best seats in the upstairs lounge area! Bugger. Let that be a lesson folks if you are catching the ferry. You don’t need to be first in the car line because you won’t necessarily end up first on the boat! We filled in our boat time with reading and playing with our many and varied electronic gadgets and filling up on caffeine (for the adults) to keep us awake. Upon landing in Troon, our first stop was the Morrison’s supermarket for food; we were starving even though we’d eaten jam sandwiches before we’d gotten on the boat. Harris was happy to see they had their bags of 8 sausage rolls for 1 pound so we all enjoyed those for ‘lunch’ at 9.30 am! 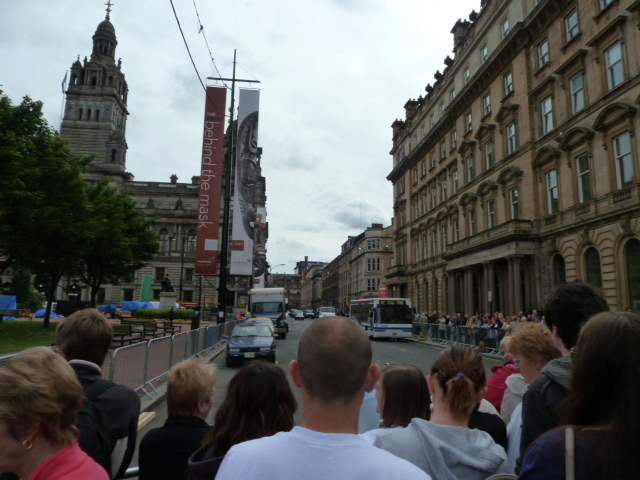 Our first destination was Glasgow. I could have spent my time on the boat researching Glasgow in my guidebook but no I didn’t so I quickly looked it up on the way. What did I learn? Well, not a great deal but I knew I wanted to see Glasgow so we would find a carpark and walk around. Glasgow is an architectural delight! There are so many Victorian style buildings, I was snapping away with my camera everywhere. 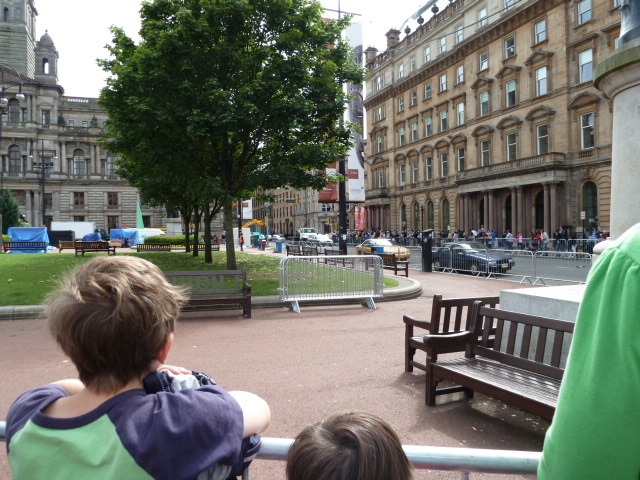 We parked at the Buchanan Square shopping mall and found some Starbucks to keep us going before going onto the pedestrian streets; drifting towards George Square. George Square is a large paved area in the middle of the city with numerous statues. When we arrived I was surprised to see metal fencing around parts of the square and crowds of people. We joined the crowd and got talking to a lovely lady that told us that Brad Pitt was in town filming his new movie World War Z, about zombies. Cool! 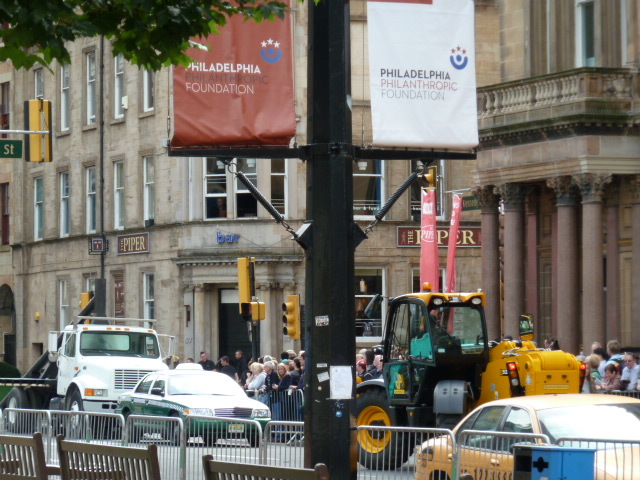 Glasgow had been turned into Philadelphia by adding American style street signs and traffic lights, American cars and taxis and even a USA flag on a building. We watched the crew setting up the street for a shoot but really couldn’t see a great deal so after standing and taking it all in we headed off in search of more interesting Glasgow sights. 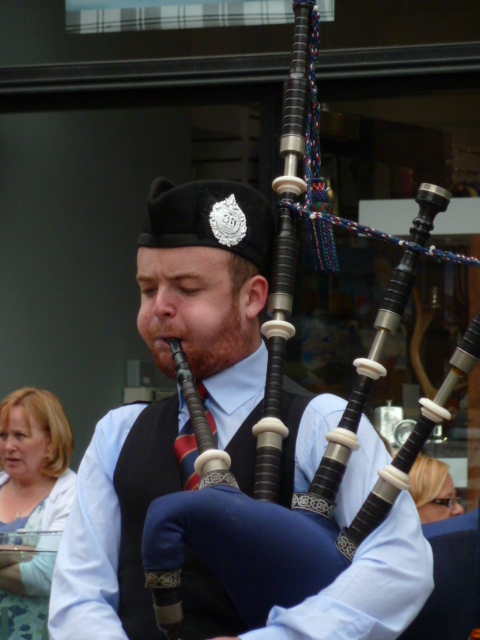 What we found was a first busking bagpiper! 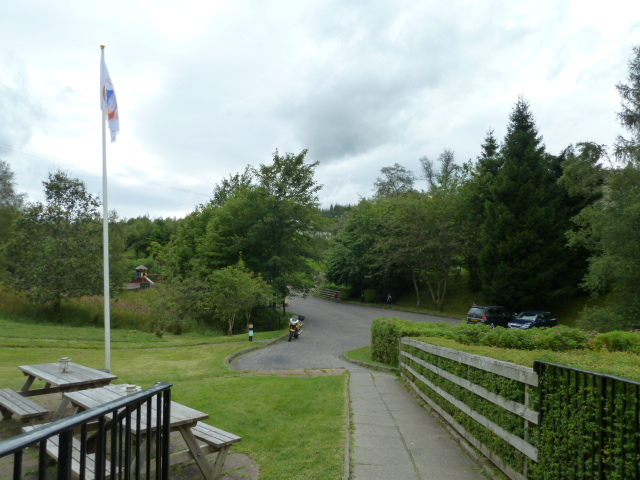 After a little more window shopping, Steve and I were starting to tire and we still had 90 kms to drive to our bed for the night in the Loch Lomond and Trossachs region. Steve drove for awhile before he handed me the wheel. Now for the fourth time in 6 months I was going to drive and guess what? The timing couldn’t have been worse as we headed around one of the large lochs. The road narrowed considerably and became very windy. For most of the drive I thought I was either going to hit the rock wall on the left of me and scrape the side of the hire car or crash it into an oncoming tourist bus that would take over my side of the road! What fun! I was certainly wide awake now and glad I’d had my caffeine hit. I was glad to finally hand the wheel back to Steve after we safely made it through the worst of the road; we were only just down the road from our YHA by then. (We heard the next day that someone had a serious accident on that road and the whole road was closed for hours). 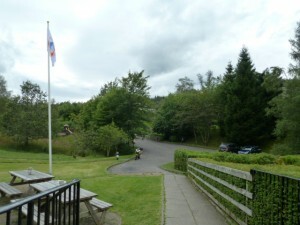 The YHA advertised that reception opened at 15.30 hrs. At 15.45 hrs the lady opened the door. If YHA reads this … get your employees to open on time! 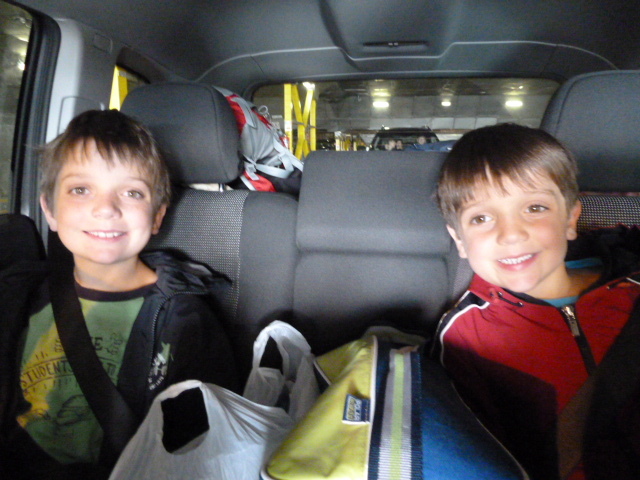 We were really keen to unload the car, shower and eat by this time; we were nearly ready for bed! Harris and I set off for the local corner store just 100 metres down the road and returned with dinner ingredients. The boys enjoyed playing games and reading in the shared lounge room before we all headed off for an early night. So far we’d had a lovely (tiring) first day in Scotland. Tomorrow … Steve’s birthday. Hope you had a good sleep after such a long and tiring day. Look out for the Loch Ness Monster, boys! Have a great time in Scotland.